Excel’s London property market experts have been advising on the best places to buy in London, what to buy and the type of tenants to target for the best possible rental yield for two decades. If you are looking to find a property for investment purposes in one of London’s most sought-after locations, why not tap into our raft of knowledge? 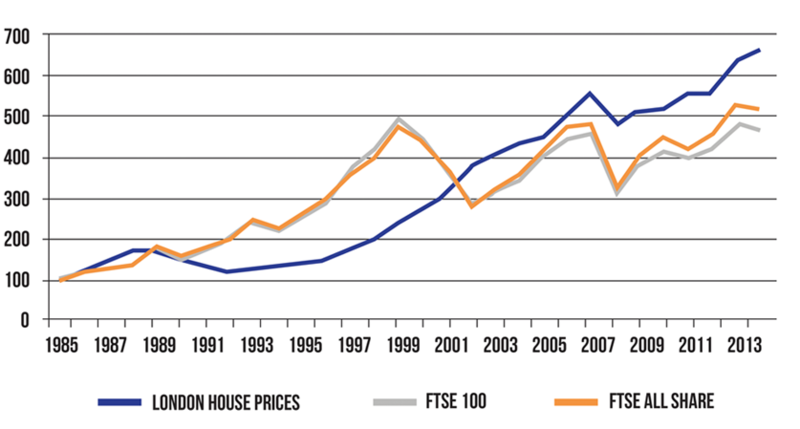 The London property price curve has increased at a greater rate against the FTSE 100 and FTSE All Share over the past 20 years and has registered more stable growth. Property yield has been consistently higher than the majority of fixed interest securities and equity dividends for the past 30 years, and property has been shown to typically provide returns over and above inflation, protecting capital from the effects of rising prices. These hard facts demonstrate precisely why property investment can be a wise route to take. What are property investors buying in London? Whilst rental yield is often an important consideration, professional investors sometimes focus their attention more on capital growth. They may therefore purchase London property that won’t necessarily offer much of a yield, but will grow as an investment over time. There are numerous options when investing in property. London wide you will find various new developments allowing the option to buy off plan. Whilst some investors may consider this a higher risk than investing in a property that is already in an established development, with expert guidance it can prove to be a lucrative decision. Providing the right type of property in the right area is purchased, it could increase significantly in value once the build is complete; especially bearing in mind London property prices have been increasing steadily in recent years. Buying off plan allows investors to purchase at a price that could potentially be below the future market value, presenting an excellent opportunity for capital returns. If rental yield is important in the shorter term but you are still looking for good capital returns in the future, you should seek to find a property with potential. There are plenty of houses and flats London wide that are ripe for refurbishment. Investing in a high end overhaul will attract corporate tenants with higher rental budgets. At Excel Property Services we have been assisting investors with a fully comprehensive range of high specification refurbishment services for more than 20 years. Being aware of precisely what is needed on the London property market, we have consistently succeeded in providing the right advice that has seen immediate occupancy time and time again. We have for 20 years held longstanding relationships with London property investors, some of which are at the point where they are ready to realise their investments. So if you are looking for an investment that is ready to let and that will start giving you a return quickly, why not talk to us about connecting you with the right seller? The majority of properties being sold by our contacts are established, successful London rentals. Many have been refurbished and kept up to date and are rental market ready. Not only can we find a property for you that is ready to let, in many cases we are also able to provide access to properties that come ready tenanted. As we specialise in corporate housing, most of the London real estate we sell on this basis comes with tenants on long term lets. Time to Invest in Bricks & Mortar? Time to Experience the Excel Difference. Our dedicated multilingual London property investment consultants are at your service. Give us a call on 020 7691 9000, drop us a line at info@excel-property.co.uk or call into see us at 146 Finchley Road.